This week’s podcast interview is all about fly-fishing high mountain lakes. 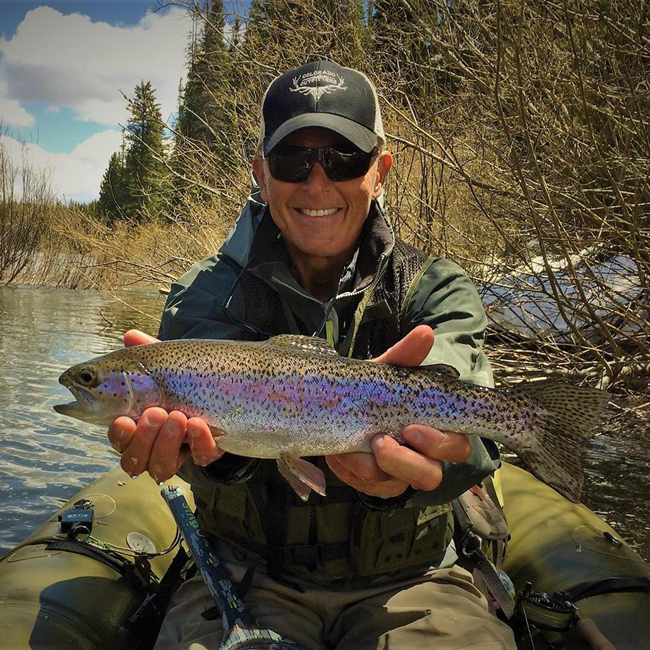 My guest is Bob Terwilliger–of Orvis-Endorsed Fly-Fishing Expedition Colorado Outfitters–who specializes in horseback fishing trips into some of the most remote wilderness areas in the lower 48. Fishing high mountain lakes has its own special techniques and philosophies—although here it is as much about the scenery and the trip as it is the fishing. If you enjoy getting away from the crowds and true wilderness fishing, this is a podcast you won’t want to miss. Can I use the Bank Shot line for fishing midges? What is the best fly rod for bass, pike, and the occasional trip to the Florida Keys? When using tiny nymphs, should I set the hook keeping my fingers off the line and just use drag pressure from the reel? What do I do if my head cement gets too thick? How can I keep my ferrules from slipping? Which is correct, the upstream reach cast or the downstream reach cast? Is it worthwhile to fish midges once winter is over? Why don’t all big trout have a hooked jaw, and what do various color and spot patterns in brown trout indicate? It sounds like Bob fishes just shoreline after horsebacking in. I’d be curious if there is a reason he doesn’t bring a float tube or belly boat. I fish trout ponds and lakes with a float tube in NH/VT/ME. Remote hike-in ponds are very rewarding – rarely fished and some large fish to be had. Minimal gear needed – float tube with backpack straps, Orvis 5wt travel rod. Reel with sinking line and spare spool with floating line. Waders and flippers. My seasonal quest is to land at least one brook trout from each of NH’s 25 fly fishing only ponds. I haven’t made it yet – got up to 17 last year – but it sure is fun trying. Well, I guess I didn’t listen long enough before commenting! He does mention them at an hour in. I use the same technique for a body of water that I don’t know well – or if they get super-finicky – trolling (or drifting) the float tube (but not in Maine) to locate fish, then casting the area when fish are located. Glad you caught the latter part where Bob talks about using the Water Master Boats on our pack-in trips. Shoreline can be great, but our ability to put people all over the lakes really does open up the fishing options and experiences. At one time or another we have all tried to reach those trout rising just out of casting distance from shore. With these boats nothing is out of reach.